There will be a few smoke filled eyes tearing up today in Hornchurch, Essex as my adopted local and that of a lot of my mates finally closed its doors. The Kings Head pub, which has stood on the same spot on Hornchurch High Street for 400 years is set to be turned into a pizzeria. Quite a shock as the only culinary edge the place has ever had is pork scratchings and roasted peanuts. My Essex mates have been going down the Kings Head since they were 16, bum-fluff, low voices and all. As a whole on average these blokes held out pretty well to distractions such as wifes and kids and amazingly kept up their Friday night institution of going out for a few pints and putting the world to rights well into middle-age. And as time moved on, and their lives changed this way and that, the smoke-filled Kings Head always remained a constant. In fact up until the last couple of years when finally girls and kids intervened they were very much part of the furniture and had their own place at the bar. In fact in all the times I have been there I never stood anywhere else but at the back of the bar, and have rarely entered through the front door, "er, we don't go down that end," would be the stunned response if I suggested it, even if it was closer to the curry house and the bank atm. 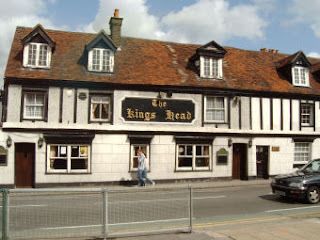 When I moved to Hornchurch in the early summer of 2002 after breaking up with my then wife, the Kings Head became part of the healing process. Mates rallied around me like mates do, and our pub conversations game me optimism and laughter in equal measures. I will never forget those often dark and terribly sad times, because in that pub with those mates, there were also ocassions when I laughed so much I thought I was going to have a coronary. One bloke, who I didn't know before I moved to Hornchurch, in particular was going through the same circumstances as me. Now him and I are what is commonly known as chalk and cheese, but our bond, stood together in that pub was terrific and him and I will always have an alliance that is hard to describe. He's also to be fair, a bloody nutter, and I wouldn't like to be his antagonist! Those boys, and one in particular, well two in particular, just that one had the pleasure of my living with him for 18 months, and for that I will be ever grateful, although he'd be lying if he said he didn't like us washing our smalls together on a Saturday morning before I went to The Valley and he went to Upton Park. Those boys and those times in that old pub I will always treasure. There would be weeks when I would be in that boozer every night of the week, and don't get me wrong, the pub was never going to win any prizes, not for it's beer, its ambience or the quality of clientele, I think girls were barred because I rarely looked at one twice. The only prize the Kings Head would win would be sponsored by Febreze. The Kings Head for 18 months was stability to me and of course 12 blokes could have stood around a camp fire and made each other laugh so much that it hurt, but we didn't, we stood at our end of the bar telling stories, just as we do when I go back now on a Friday night.